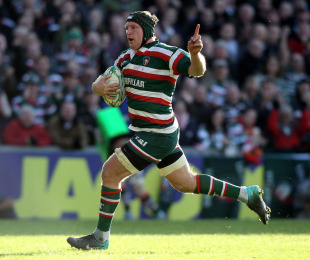 Leicester No.8 Thomas Waldrom is targeting a place in England's Rugby World Cup squad after discovering that he qualifies for selection thanks to his grandmother. The 27-year-old New Zealander, who joined Leicester last summer, had already set his sights on an England jersey, but believed that he would have to complete 36 months of continuous residency before becoming available. A meeting with his agent clarified the situation and he woke up his mother in New Zealand to get confirmation that his 'nana' had in fact been born in England. "In theory, I could play tomorrow if they wanted me. I don't have to wait three years anymore," Waldrom told the Leicester Mercury. "I would definitely take it if I got the nod for the World Cup. "My agent came round and he brought the pamphlet with the International Rugby Board's rules regarding qualifying after residency. My wife was going through the criteria. She saw the line about being able to qualify immediately if one of your grandparents was born in the respective country. "I remembered reading somewhere that my grandmother was English. I rang up my mum in New Zealand, where it was four o'clock in the morning. I apologised for waking her up and asked if nana was born in England. She said yes, and that she also had the birth certificate to prove it." A former representative of the Hurricanes and Crusaders in New Zealand, Waldrom was overlooked for All Black selection and would relish the chance to face the country of his birth. "It would be a great honour to put the shirt on," Waldrom said. "It would be a privilege to play against the All Blacks if the chance came along, and would be a chance for me to show them just how good I am."